The New Basin Distilling Company blog helps you stay aware of what is going on at the distillery, in central Oregon, and in our fields. We had a great group of Sorority Sisters visit the distillery this week for a tour and tastings. They were great fun and big fans of our First Cut Vodka Huckleberry Lemonade. In honor of them, I promised to post our recipe on the website. Shake over ice and serve with a slice of lemon and fresh huckleberries. Then enjoy! We serve samples of this drink in our tasting room. Stop by any Friday from 5-8 or Saturday 1-6 for a taste and tour. We are also well stocked on our Christmas gift boxes. Lots of variety to choose from with special drink kits for martinis, our Madras Mule, and Huckleberry Lemonade Martini's. Build your own box options are also available to customize and get just what you want. We look forward to meeting you. We have been giving samples of our Madras Mule at the distillery and they have been a big hit. We use our amazing Strong Whiskey in place of the traditional vodka used in a Moscow Mule. We mull lime and fresh Madras mint and add ginger beer. And of course we serve this in the traditional copper cup. This makes a refreshing summer drink that stays ice cold in the copper. Even the biggest skeptics have ended up loving this drink! Stop by the distillery and we would be happy to give you a sample. You can taste for yourself! We are there every Thursday, Friday and Saturday from 1-6. On another note, we will also have a vendor booth at the Crook County Fair, August 10th-13th. If your out and about at the fair, look for us and give us a try. We will not disappoint! Our new still has been delivered and is really amazing! We opened this weekend for tastings and tours and had a great turnout. We are appreciative of all of our visitors. We had a great time. We will be open again this Friday and Saturday from 5-8 pm. We would love to have you stop by for a taste of our delicious spirits and to take a tour of our distillery. We have a great deal of merchandise and can't wait to show you around. We have been busy at New Basin Distilling! Our new still has been fully installed and we are gearing up for our first run. We had a great time at the ERA Rodeo and we appreciate everyone who stopped by to visit us! Our Strong Whiskey, Stagger Gin, and First Cut Vodka are all now available in all Central Oregon Liquor Stores. Please look for us on the shelves. We have a new rather unique highway sign. We had a lot of fun creating it and it is bringing us some new visitors from out of the area. We LOVE to have guests. We are providing tours, tastings, and have a great deal of merchandise in our merchandise room. We will be open this Friday and Saturday night from 5-8 (April 8th and 9th). We are inviting our special guests from the Oregon Cutting Horse Association and will be open to the public, as well. Everyone is welcome! We will have snacks and all of our usual fun. Even if you have been here before, we welcome our repeat friends! If you don't see a time open and you would like to plan to stop by, let us know and we would be happy to meet you. You can contact us here or on our New Basin Distilling Facebook page. We will be extending our hours of operation through Spring and Summer..... Stay tuned! Stop by- we look forward to meeting you. Our new still is finally on its way. As many of you know, our distillery has been temporarily closed while we have prepared for a slight remodel to accomodate our amazing new still. 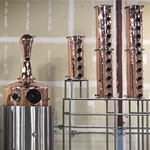 It is a 24-column, custom made copper still. We don't know of another still like it in Central Oregon. We are currently producing 3 top quality products- Stagger Gin, First Cut Vodka, and Strong Whiskey.